Gastroesophageal reflux disease or GERD, a condition in which the backward flow of acid in the stomach causes heartburn and esophagus injury. Rabeprazole helps decreases the amount of acid the stomach makes thus decreasing also the symptoms of GERD like heartburn, persistent cough and difficulty swallowing. It helps heal the damage in the esophagus and stomach due to the acids. It prevents ulcers and may also prevent cancer of the esophagus. It is used along with other medication to eliminate H. pylori bacteria that causes ulcers in adults. Rabeprazole is the newest member of the Proton pump inhibitor. Its healing rate is comparable to that of other PPI drugs like Omeprazole. However, it provides a more consistent and significantly superior improvement of the conditions being treated. It is also well-tolerated. Buy Rabeprazole 10mg here. Rabeprazole comes as a delayed-release tablet and sprinkle capsules to take by mouth. Take this medication once a day in the morning after the morning meal for the treatment of ulcers. Take it twice a day in the morning and in the evening for 7 days to eliminate H. pylori bacteria. For the sprinkle capsule, use it once a day 30 minutes before breakfast. Open the capsule and sprinkle the granules on soft foods like an apple sauce and yogurt and swallow the mixture right away. You can also pour it in cool liquids. Take this medication exactly as prescribed. Do not take more or less and longer than what is prescribed. Do not crush or chew the tablet. Swallow the tablet whole with a glass of water. Do not stop taking this drug without your doctor’s knowledge. Continue taking this drug even if you feel well. 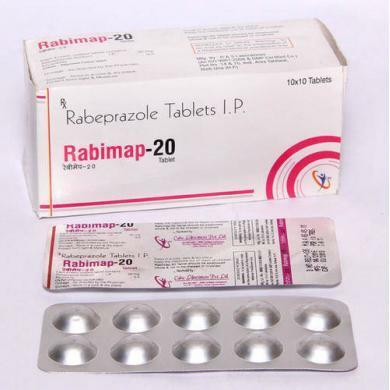 Buy Rabeprazole 20mg here . Rabeprazole like other proton pump inhibitors may increase your risk for bone fracture when used over a long period of time. Seek medical help if you have heartburn with sweating, dizziness and unexplained weight loss. This medication raises your risk of having severe diarrhea. Contact your doctor if you have stomach pain, watery stool and fever that don’t go away. Do not use this medication with HIV drug and blood thinner. Patients with a liver problem must use this medication with care.